Curriculum Tracking Templates - Created by Brent Phillips, these links for grades K-8 will take you to specific tracking templates for each strand in each subject area. The easiest way to utilize these templates is to print a copy of each template from all of the strands you teach and then use them for planning your activities and curricular goals. The whole strand on one sheet! No more awkward and poorly organized curricular documents! These templates can also be used to provide the teacher with an overall picture of which expectations specific students have achieved, and at what level of performance. Excellent for tracking progress throughout the year for each student. edHelper has over 6000 lesson plans organized by subject, and over 1000 WebQuests. Gifted - A Different Place - Online resources and lesson plans for the gifted student. Teachersfirst.com -Very user friendly site divided by subject and grade level that has a classroom resource finder which you can use to search for Internet. 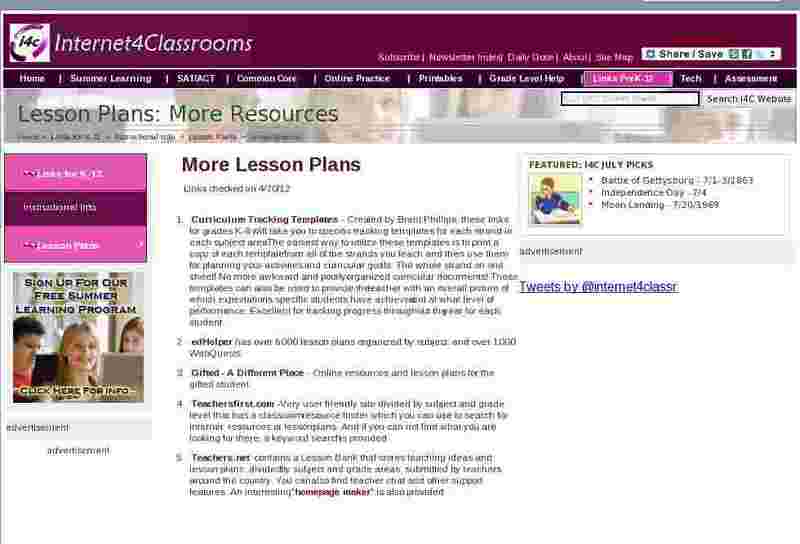 resources or lesson plans. And if you can not find what you are looking for there, a keyword search is provided. Teachers.net contains a Lesson Bank that stores teaching ideas and lesson plans ,divided by subject and grade areas, submitted by teachers around the country. You can also find teacher chat and other support features. An interesting 'homepage maker' is also provided.